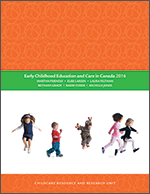 This bibliography includes empirical research evidence and policy analysis on a number of domains relevant to differences between for-profit and non-profit child care. It is not completely exhaustive but includes the most pertinent documents. Most of the documents included are in published sources, primarily peer-reviewed sources. There are many additional position and policy papers, news stories, explanatory documents and other material on this topic that are not included here. Note that some studies fit into more than one category but are listed only once below. Materials are organized by topic, then by year (most recent to least). This bibliography was first released in 2010; updated November 2011.